Desk tray supports work with letter-size or legal-size document trays and either front-loading or side-loading trays. Design features smooth, rounded lines and a polished surface. Perfect for traveling or on site needs. 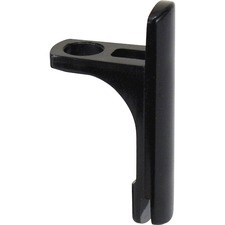 Features a low-profile metal clip and hang hole. Holds Paper Size: Memo Size; Clipboard Actual Size: 6w x 9h; Clipboard Material: Plastic; Clip Capacity: 1/2".